At Stanford University's Bing Nursery School in Palo Alto, Calif., blocks play a significant role in helping children to think creatively, solve problems and think like young mathematicians. 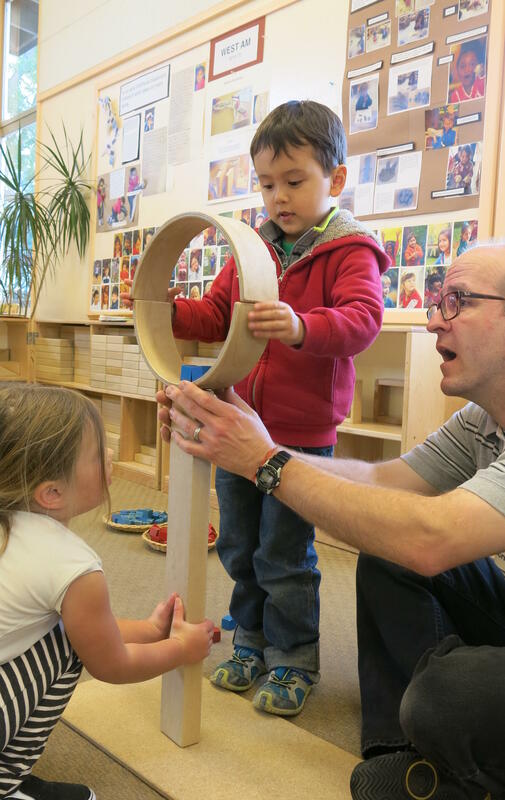 Four-year-olds Jacques and Corinne work with teacher Todd Erickson to balance and secure two semicircular wooden blocks atop two long, straight ones. One child's stage is another student's obstacle course. Preschoolers at Bing Nursery School play with outdoor blocks. Today we explore the simple, powerful tool that is still alive and well in some early learning classrooms: the wooden block. You might call it the anti-app. Measurement. Balance. Math. Negotiation. Collaboration. And fun. The smooth maple pieces need no recharging, no downloading. "Let's just put these blocks up," says 4-year-old Jacques. "I think this will probably work. Be careful, Corrine." "I know," says Corinne, who is also 4. With focused intensity, Jacques and Corinne work to balance and secure two semicircular wooden blocks atop two long, straight ones. The tower collapses to the carpeted floor at Stanford University's Bing Nursery School. It is Silicon Valley, after all. Fail early, fail often, kids. Iterate. Collaborate. Jacques makes a pitch for stability. "Corinne, I think if we just put a little on each side and used the right amount where mine was, it would work," he says. "OK?" "OK, let's try," says Corrine. "OK!" Then, to paraphrase Homer, the tower falls thunderously and the blocks clatter about. "It keeps falling down! Maybe a little higher," Jacques says, resisting the urge to lose patience. The block party is on. Soon other kids wander over to try to help build this hour's great random structure. "If we can't do it, we could build something else!" "OK, what?" Two blocks or four? Big or small? What shape? This negotiation and collaboration, pre-K style. "Those are the kinds of skills that we need later on," says Jennifer Winters, the Bing school's director. "We'll need to learn to work together on projects, to collaborate, to bounce ideas off one another." Don't call it a comeback: Blocks have been here for more than 100 years. In 1913, progressive educator Caroline Pratt designed "unit blocks" as a central part of the curriculum at the school she founded in New York City, which still uses blocks. Pratt wrote of blocks: "I wanted something so adaptable children could use it without guidance or control, I wanted to see them build a world ... to re-create on their own level the life about them ..."
Pratt's vision and ideas greatly influenced the founders of Bing, which is a laboratory school. That means Stanford's psychology department conducts research on child development there, and students assist the professional staff of preschool teachers. 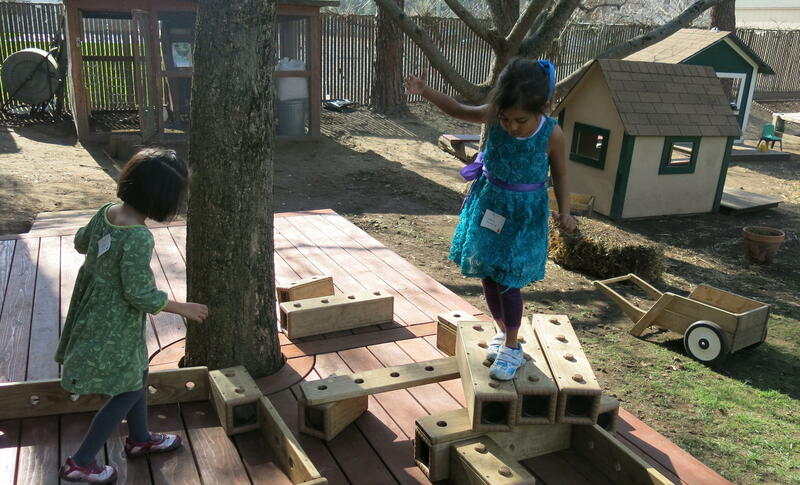 "Pratt observed that the real learning was occurring when they (kids) had unscheduled, free play time," says Winters. 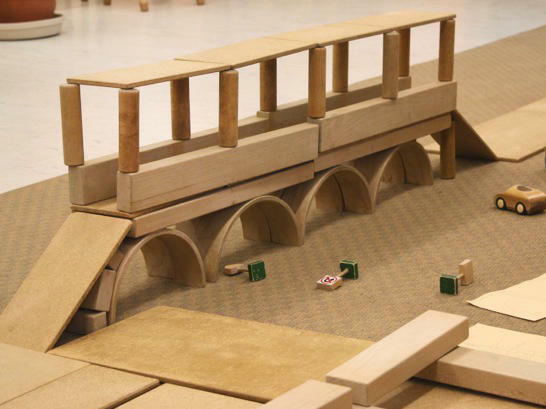 "Children still need those hands-on, tactile materials to make sense of the world." Several early childhood studies have shown that children who play with blocks have better language and cognition skills than control groups. Others have looked at the power of blocks to help teach math, as well as the relationship between unstructured play materials and learning. Research has shown that math skills are the biggest predictor of later academic success. "What's special about the blocks is that they provide an excellent venue, an excellent platform for parents and children to engage with one another. Which is really critical, not just to children's language development, but to their cognitive development generally and their social development as well," says Dr. Dimitri Christakis, a pediatrician, researcher and professor. But they're also just a lot of fun. At Bing there is no prescribed "block period." The kids are simply given time for open-ended exploration. Tightly scheduled events aren't part of this school. "It's a little bit of sucking the joy out of it: 'Now you have to do this,' as opposed to wanting to do that," Winters says. The school's emphasis is on free-range play. Here blocks — along with clay, paint, sand and water — are the basic materials preschoolers use every day. Wander in, wander off. Play hard, live free. "When children are allowed time to think, to observe, to interact with their environment, their minds are bringing in all this information," says Todd Erickson, one of Bing's head teachers. "With that gift of time, it really unlocks a lot of creativity, a lot deeper thinking because they can mull and let their unconscious work on it." And blocks, lots of them, aren't just used inside. In the school's spacious, grass-covered yard, 4-year-old Yuri works alone turning large, hollow outdoor building blocks into her imaginative play area. A stage is born. She looks at the spaces between two sides and starts to grapple with different sized pieces to bridge the gap. See, in a sense, she and other kids working with blocks are really starting algebra, Erickson says. "Essentially they're solving for X," he says. "They've got one piece on one side and one piece on the other and a distance to fill. So what is that amount going to be, what does the length of that block have to be to bridge, to sit at both edges of the block. It's the beginning of mathematics, really." The blocks are all multiples and fractions of a basic unit. Director Winters says it is really a way to start on math. "They're not just stacking up and making a wall," she says. "Children can do complex math projects with blocks even into elementary years, and we forget that." Ten focused minutes later, Yuri loses interest. A swing beckons. But two other girls wander over and turn Yuri's half-built stage into a makeshift obstacle course. Dramatic, imaginative play ensues with blocks as the props. Erickson says he's regularly in awe of the continuing pedagogic and play power of these basic pieces of sanded maple. "I think they are so simple that's it's very easy to look down on them, almost, to disqualify them in terms of their complexity," he says. "There's work with balance. Science. Math. Social emotional language. All these things interweave so beautifully in such a sophisticated way for such a basic material. It's really amazing." Today, blocks are still in heavy use in pre-K and kindergarten classes across America. But block use overall is in decline. No, there are no hard numbers on this. But anecdotally, teachers say free play time is slowly getting chipped away to make time for more formal academic exercises and proscribed projects. At an outdoor bench, 4-year-old TJ is hammering together small scrap blocks of wood using a real hammer and real nails. A teacher is there to help as needed. TJ is working off a raw yet fairly detailed paper sketch he made. "This is my instructions. I drew it with this pen. This is the first page," he shows me. "This is the second page." I marvel at the rough, yet wonderfully done blueprint for a block car. "It puts lots of things together to make this whole thing with all those blocks," he explains. It's kind of a Henry Ford meets Elon Musk, I tell him. "Yeah!" TJ says, unsure what I'm babbling about. "I'm ready, teacher Emma!" he says politely, yet firmly. He needs a little help hammering that last wooden wheel. And we're going to hear some sounds now from the classroom. There's a lot of debate about how much screen time kids should get and what educational apps might help them learn. But today, we're focusing on what you might call the anti-app - the humble wooden block. Many early childhood teachers say blocks are essential tools for preschoolers to start learning basic math, collaboration and much more. Eric Westervelt from the NPR Ed team gets down on the block floor in this installment of Tools of The Trade. JAQUES: Let's just put these blocks up. I think this will probably work. Be careful, Corinne. 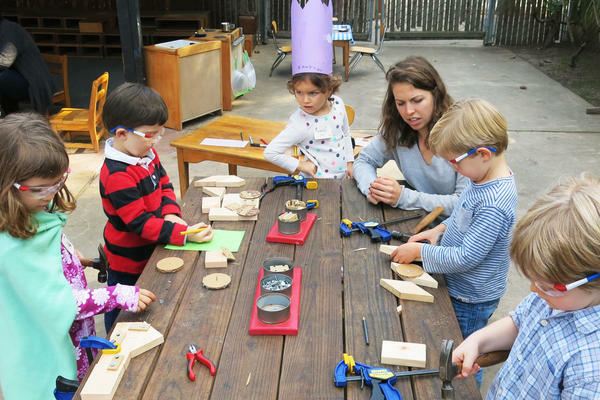 ERIC WESTERVELT, BYLINE: With the focused intensity of ordinance disposal experts, preschoolers Jaques and Corinne work to balance and secure two semicircular wooden blocks atop two long, straight ones. CORINNE: We can put them on the other side. JAQUES: It keeps falling down. JAQUES: Maybe a little higher. WESTERVELT: They work the problem. More blocks are enlisted to help fight gravity. It is Silicon Valley - fail early, fail often, kids - iterate. JAQUES: Corinne, I think if we put it a little on each side and you stack the right around where mine was, it would work, OK? WESTERVELT: Soon, other preschoolers wander over to try to help build this hour's great random block tower at Stanford University's Bing Nursery School. JAQUES: If we can't do it, we can build something else. WESTERVELT: Bing is a laboratory school, which means the psychology department conducts research on child development here. The school's emphasis is on free-range play. Here blocks, along with clay, paint, sand and water, are the basic materials preschoolers use every day. Wander in, wonder off - play hard, live free. WESTERVELT: What are you guys doing, man? What's going on? UNIDENTIFIED CHILD: We're going to find the bad guys and see where they are. WESTERVELT: And blocks - lots of them - aren't just used inside. In the school's spacious grass-covered yard, 4-year-old Yuri works alone, turning large, hollow outdoor building blocks into an imaginative play area. WESTERVELT: What are you building there? Are you just going to see what happens, or you have an idea? As her stage takes shape, Yuri looks at the spaces between two sides and starts to grapple with different-sized pieces to bridge that gap. Todd Erikson, a head teacher here, whispers to me, see, in a sense, she's really starting algebra. TODD ERIKSON: Essentially, they're solving for X. They've got one piece on one side, one piece on the other. And they've got a distance to fill. So what is that amount going to be? What does the length of that block have to be? It's the beginning of mathematics, really. WESTERVELT: Ten minutes later, Yuri loses interest. A swing beckons. YURI: Do it very careful. WESTERVELT: Teacher Erikson says he's regularly in awe of the continuing pedagogic and play power of these simple pieces of sanded maple. ERIKSON: I think they're so simple that it's very easy to look down on them, almost - to disqualify them in terms of their complexity. There's work with balance, science, math, social-emotional language. All these things interweave so beautifully, so - in such a sophisticated way for such a basic material. It's really amazing. WESTERVELT: Several early childhood studies have shown that children who play with blocks regularly have improved language and cognition skills. But they're also just a lot of fun. No downloads necessary. WESTERVELT: What are you making there? On an outdoor bench, 4-year-old TJ is hammering together small scrap blocks of wood. A teacher is nearby to help as needed. TJ's working off a raw yet fairly detailed paper sketch he's made. TJ: This is the first page. This is the second page. WESTERVELT: Whoa, you've got a whole blueprint there for a car. TJ: Yes. It puts lots of things together to make this whole thing with all those blocks. WESTERVELT: It's kind of a Henry Ford meets Elon Musk. I like it. WESTERVELT: Eric Westervelt, NPR News. TJ: I'm ready, teacher Emma. Transcript provided by NPR, Copyright NPR.